Do you know the history of the 3100 block of Broadway? In 1940, the O’Rielly family lived at 3100 Broadway, today the site of a commercial office building. 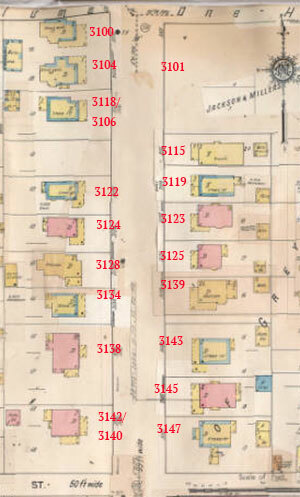 The Sanford Fire Insurance map from 1909-1950 shows the homes that used to sit along Broadway. None of these homes exist today. Today, the 3100 block of Broadway is made up of commercial office towers, medical and community college buildings. But as recently as 1940, the block looked completely different. 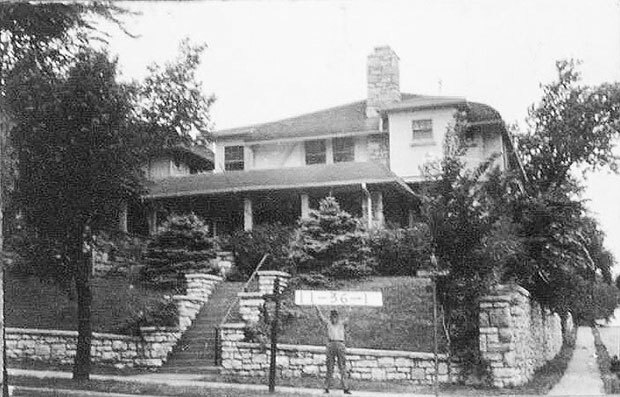 It was then dotted with large family homes like that of the O’Rielly family at 3100 Broadway (the current site of the Penn Tower office building). In the 1930s and 1940’s. James O’Rielly, who died in the home in 1949, was the president of the Owl Drug Company. He and his brother had several drugstores in downtown Kansas City. The O’Rielly family witnessed the transformation of Broadway from a residential street to a major commercial corridor. They protested against the rezoning of the house next door in 1933 for business use, but by the mid 1950s this section of Broadway had undergone a major transition, becoming known, according to a 1959 Kansas City Star article, as a “good insurance address” with 17 insurance-related firms located in the area. Many of the stately old homes were first converted in offices and later torn down and replaced with larger buildings. The slideshow below shows the 1940s tax photos of the block. There’s still a lot more to learn. Do you remember this block? What special memories do you have of this section of Midtown, which is now in the Valentine and Old Hyde Park neighborhoods? What questions do you have about it? Let us know and we’ll share your history and help to preserve it on our website. It is ironic that I see this post, as I once had the thought as I went past the Liberty Memorial Park and was driving south on Broadway up to 31st, that this area would feel so much more elegant and similar to the Loose Park area, if they had only built beautiful residences here as they did there. To then find out there were once beautiful homes here. The buildings that replaced all of them are utterly unnoteable, featureless, and without character. What a loss for Midtown and one of the many reasons this area of town has been viewed as so substandard to locals for decades now. One can drive into the surrounding neighborhoods and see many beautiful homes, but Broadway is their front door, and who wouldn’t judge the area homes behind these buildings to be anything but slum-like, considering the condition in which major venues like Broadway and Main have been allowed to degenerate to the degree they have. Had the homes here, been replaced with buildings of character, like many of the larger pre-war structures along Armour, this section of Broadway might have had a chance of revival: now other than the Redemptorist Church further up, not a single structure is notable and forever destined to mediocrity at best.